BEDFORD -- Private aviation, once an option only for the rich and famous, now has a company that's the equivalent of Priceline.com, the ''name your price" online flight-booking service. OneSky Network serves as the Web link between passengers and companies that operate more than 1,500 private jets. And starting this morning, OneSky will be the focus of a big new promotional campaign at -- where else? -- Priceline.com. The company, which has been ramping up operations and now has about 200 regular customers who fly out of Hanscom Field and other private airports, lets business and vacation travelers shop for prices up to 50 percent off market rates for seats on private flights that would otherwise be operating empty. In what it calls an ''ultimate upgrade" sweepstakes, Priceline will award five people who book regular commercial airline tickets or hotel rooms through the website between now and May 8 free travel, worth up to $30,000, on private planes flown by OneSky affiliates. First, ads on trays. 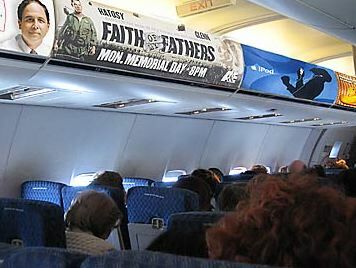 Now, via adrants, Ironic Sans muses about the idea of advertising on overhead bins: "I’m not even sure I should file this under 'Ideas.' Maybe I need a category called 'Predictions.' This seems sort of inevitable to me." Note Dr. Zizmor in the upper left! What's cool about Japan? The premise of the new NHK-BS program called “Cool Japan” is that first impressions offer the best clues. It’s a reasonable assumption. The Japanese themselves, like natives anywhere, take their environment too much for granted to know. Long-term foreigners — like long-term foreigners everywhere — are probably too jaded to think anything’s cool. Enter the wide-eyed newcomer. His or hers are the eyes that see what others miss. The program format confronts moderator Shoji Kokami with 10 greenhorn gaijin — anyone in the country longer than six months need not apply. Naturally, there’s a language barrier, and so Kokami is assisted by simultaneous interpreters. Budgetary constraints making it impossible for NHK to hire qualified interpreters versed in all the native languages of all the short-term foreigners in Japan, the choice of guests is restricted to those speaking English. The program debuts in April. Writing in Spa! (April 4), Kokami tells us how things are going so far. The first program will deal with the Japanese home. What is cool about the Japanese home? Four things above all: tatami, sliding fusuma doors, high-tech toilets, and — slippers.